Tocho was orphaned in 2005 when his mother was shot by a poacher. He wasn’t even old enough to be weaned from his mother’s milk when the poacher sold him to two young men. The men thought he’d make an interesting pet, but didn’t want anyone to find out they had a mountain lion kitten, so they kept him in a dark shed where he was deprived of sunlight. They had no idea how to feed a growing baby mountain. Luckily, Tocho was discovered, confiscated by the Arizona Game and Fish Department, and brought to Southwest Wildlife for care. His initial health assessment was shocking. He had three broken legs and a crushed pelvis; his improper diet caused metabolic bone disease, making his bones weak and fragile. The only way he could move about was to pull his body across the floor using his front legs. It took many months of care, and working with a nutritionist who developed a special formula to rebuild Tocho’s bones, before he was able to use his legs. Today, he’s a happy and healthy big cat. His legs are short when compared to his body size, but he gets around quite well. 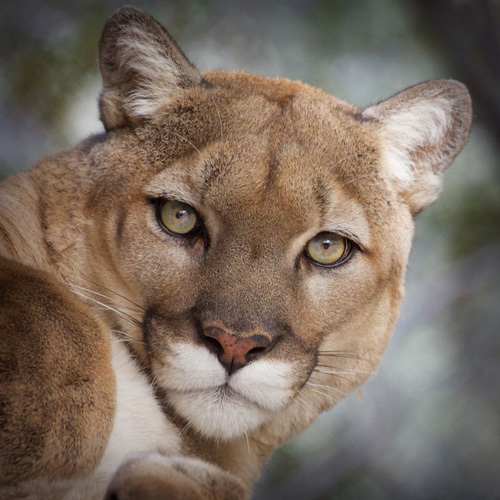 Tocho lives with two older female mountain lions, Cascabel and Cleo. When they were first introduced, the girls weren’t very nice to Tocho, but now that he’s matured and is significantly larger than either of them, he’s the one in charge. Tocho never misses a tour and can often be heard purring to those lucky enough to be in the front row. As Tocho ages, his earlier life of hardship will continue to give him medical problems. Sponsoring Tocho helps to give him the care and well-being he craves.